It is a type of recreational vehicle like no other thanks to it’s the best over-the-road truck chassis with beautiful styling and impressive construction. Dynamax Corporation is well known for producing luxurious, eye-catching designed recreational vehicles, which provide the travelers pleasure and enjoyment while on the road. This famous company has been producing quality RVs since 1997 and since then they have produced all kinds of recreational vehicles starting from luxury Class A RVs to their Class C models which are said to offer " best in class" luxury and performance. Dynamax motor homes provide comfortable and smooth ride and come with incredible durability and longevity. They are built to accommodate travels for years to come. Each Dynamax motor home comes with rock-solid foundation, its interior exudes aesthetics and comfort with thoughtful floorplans which provide owners feel at home on the road. This prestigious recreational vehicles are equipped with stylish décor options, smart storage solutions, plush furnishings and solid wood cabinetry. Not to mention high-end appliances and modern electronics which make this motor home one of the most luxurious among all others. Models of Dynamax RV motor homes are: Isata E-Series, Isata F-Series, DX3 motor home, DynaQuest ST motor home, DynaQuest XL motor home, Grandsport GT motor home, Grandsport Ultra motor home, Trylogy Fifth Wheel. Dynamax Isata E-Series motor home is an excellent motor home, which provides drivers not only great maneuverability but excellent comfort too. This recreational vehicle is smaller then Class A diesel pusher thus making them ideal for smaller families, and couples who want to enjoy all the comfort. With its great storage, living space and sleeping area Isata E-Series can be a serious alternative to luxury hotels. Length 24'6" 25'9" 25'9" 28'11" 28'11"
Height 10'1" 10'1" 10'1" 10'11" 10'11"
Wheelbase 171" 179" 179" 200" 200"
Dynamax Isata F-Series motor home is a smaller recreational vehicle but comparing to all other Class C motor homes, Isata F-Series is more maneuverable offering at the same time bigger, and more comfortable sleeping space then Isata E-Series thus making it more convenient for longer journeys. It comes with very attractive flooring, luxurious ultra-leather upholstery, and rich hardwood cabinetry. Length 26'11" 28'2" 28'2" 31'4" 31'4"
Height 10'9" 10'9" 10'9" 10'9" 10'9"
Width 101" 101" 101" 101" 101"
Wheelbase 200" 201" 201" 215" 215"
Dynamax DX3 motor home is designed to enhance living experience of the travelers. It is equipped with brilliant Cherry hardwoods, exquisite styling, and premium appliances. I have to tell you, you might not know or have ever seen the Grand Ultra Sport Dynamax RV motor home, but when you do, you will never forget that look. Let us learn about the outside first. Looking at the front coming towards you from behind, you would think a semi is gearing up on you. The front looks like a semi and the body is specially designed for travel. I was amazed at the look, but even more amazed at the interior. I am not sure if I can describe in words the inside of this motorcoach. It is just beautiful and elegantly designed. This recreational vehicle has a couch that folds down into a bed surrounded by delicate lighting. The bedroom has enough room to get around the queen-sized bed and offers plenty of storage area. Carpeting and travertine flooring fill the mobile home and adds to the elegance of the interior. The driving area is unlike any semi I have ever been in with its comfortable driving chairs and the dashboard has so many switches and the all-famous GPS. The bathroom on the other hand, is more elegant looking than the bathroom I have at home. I have never seen anything even remotely close to this type of motorcoach. The entire interior and all its accessories make this recreational vehicle highly rated in my book. The Dynamax RV motor home is a necessary see for everyone. 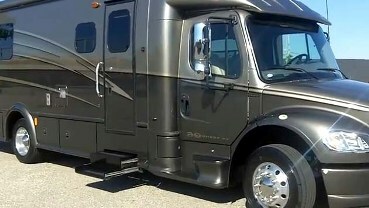 I can just see many of you switching from a pop up camper or a smaller RV mobile home to a luxurious and comfortable riding RV such as this one. I also hear that the engine and chassis is sound on these RV’s as well. Get out, see some camper shows, and take a good hard look at the Dynamax Ultra.